The hashtag made me giggle even more. 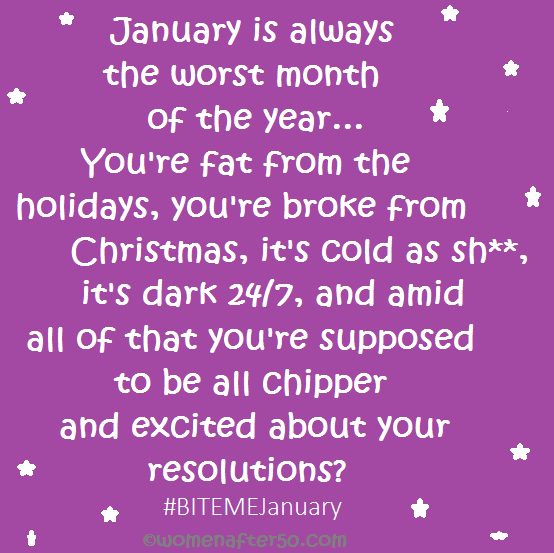 It’s no secret around here, I’m not a fan of January. I’m sorry. And maybe I giggled so much because that picture summed it up… although it’s off a page for women after 50. I’m not 50 yet. I think (don’t quote me) I’m 34. I may or may not be. Most days I’m not sure how old I am but I can tell you my birthday, does that count?I hope Christmas treated you well. It was good here at my house. Hubby and I were a little off in our Christmas spirit. I think there’s a lot of stresses we’re dealing with. Nothing life-threatening or anything, just some things that we’d like answers on. Right here is where I would ask for prayers, but I hate when people do that but don’t give many details. I just don’t feel like I can put the details out there right now, so that makes me feel like a hypocrite or makes me feel guilty asking for prayers when you’re not sure what I want the prayers for. I’m not ready to give up my Christmas trees, music, and movies yet… although I have started tearing down trees. Yes, multiple. We had 3 this year. 2 have all ornaments removed and put away. One has the top removed. The shortest is still up and decorated but by the end of the day, I doubt it will be either. I’m just being lazy to go outside to the shed and dig for boxes. I’d have to dig because we’ve piled stuff in since the end of November/Beginning of December and in case you didn’t know, IT’S COLD OUTSIDE. Well, if you don’t live in Missouri you may not know that but gosh it’s cold outside. Today’s high was supposed to be 22. I’m not sure what it is right now, I’m kind of scared to look. We started out the new year with a frozen pipe in the kitchen. That’s always fun. We also started out the New Year by going to our dive shop and celebrating the New Year! So this year on our SCUBA blog, for the month of January we’re doing 31 blog posts in 31 days. I have multiple guest bloggers even. My goal was to have 30 out of 31 scheduled by January 1 and that last would be scheduled by eobd (end of business day) New Year’s Day… but it didn’t happen. As of yesterday, I had 23 scheduled, and as of today, that number went to 24 although now 2 of those have posted. One was written by the birthday girl herself. Since today is her birthday I made it post on her birthday. The other was written by yours truly, although I didn’t really write them. I figured most people wouldn’t read on New Year’s Day so I just scheduled a filler post. So that’s what’s happening around these parts… how’s your life going? Any New Year’s Resolutions I need to jump on board with (don’t think I will though… I’m not into those for some reason….) But I still want to know if I’m missing out on something special!